Calling all nature lovers, this 9-hour tour of the Poas Volcano National Park and La Paz Waterfalls showcases the best of Costa Rica’s natural landscapes. Departing from San Jose, you’ll eat breakfast and take a plantation tour at the Doka Coffee Estate before visiting the sulfurous crater of Poas Volcano. Then, take a rain forest trail to La Paz Waterfall Gardens, also home to a birdhouse and butterfly garden, Breakfast, lunch, and hotel pickup and drop-off in San Jose are included. At 7am, an air-conditioned vehicle collects you from your San Jose accommodation to begin the 1.5-hour journey to Doka Coffee Estate, nestled amid strawberry farms and fruit plantations. On arrival, eat breakfast and tour the coffee plantation to learn about the production of Costa Rica’s famous coffee beans. Then, continue to Poas Volcano National Park to admire its gaping main crater and learn about the diverse ecosystems that thrive in the region. 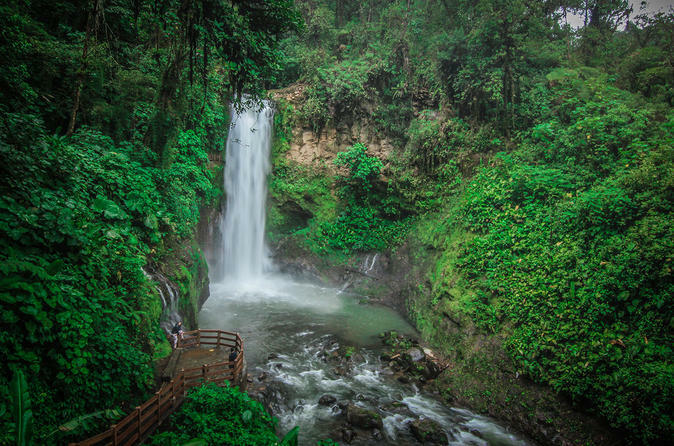 Following your visit to the volcano, you’ll stop at La Paz Waterfall Garden to revitalize with a buffet lunch. Trace a rain forest trail replete with wildlife to the La Paz Waterfall, which is surrounded by a hummingbird gallery, a reptile house, an aviary, and a butterfly garden. Your tour concludes with drop-off at your San Jose accommodation at approximately 5pm.